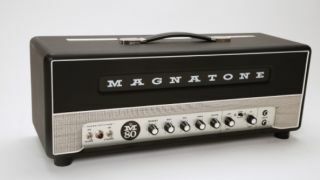 NAMM 2019: American boutique amp maker Magnatone celebrates 80 years in the business in 2019. Alongside a handful of cool new products, they’ve also produced a couple of seriously cool anniversary editions of classic models. Let’s take a look at what they’ve been cooking up. Magnatone’s special edition 80th anniversary amp is a highly collectible version of the popular Double V. The amp features 17 tubes, dual mono-block power amps with two pair of 6L6 power tubes and two GZ34 rectifier tubes, to produce 70-plus watts of stereo power. On-board you’ll also find a dual stage stereo vibrato using eight silicone carbide varistors for lush stereo pitch-shifting vibrato; and tremolo and reverb driven by two 12AU7s, one 12DW7 and eight 12AX7 tubes. The amp has been designed with a split chassis in order to separate the power and preamps for heat dissipation and weight displacement, meaning that two players can use the amp at once and enjoy independent volume control. Another special feature is the inclusion of two independent preamps with full EQ, and a stereo input, similar to Buddy Holly’s 1958 Magnatone 280. Outputs include right and left external speaker jacks, a stereo line out and stereo effects loop. Just 80 of these special editions will be made, each with hand-engraved and numbered gold-plated plaque, plus certificate of authenticity. This sort of engineering doesn’t come cheap. The Magnatone Double V 80th Anniversary Edition will cost you $9,999. Another anniversary model sees Magnatone combining two iconic models into one. The low to medium gain tones of the Super 59 Mk 2 plus the extra gain stage of the Mk 1 have been merged to create the Super 59 80th Anniversary edition. Like those legendary amps, the Super 59 is powered by two EL-34 power tubes for a full 45 watts of all tube power. The amp is hand built in the USA and comes available as a head, cab and combo, including a tube buffered effects loop and bags of tone control. To own one of these beauties you’ll be looking at parting with $2,599. For a distinctly British vibe, the Magnatone Super 15 packs EL-84 tubes and 15-watts of power into a compact 1×12 combo, or a head with matching 1×12 cabinet. The new lower wattage model reduces weight and size, but delivers the same power and tone we’ve come to expect from Magnatone. The Super 15 also boasts the same full EQ section of tone controls and effects loop found on the bigger model, the Super 59. The new Super 15 also has a new speaker emulation feature so you can practice quietly, or use headphones, but still tap into its full dynamic range going direct into a mixing console or computer. The 1x12 combo will cost $1,999, while the head on its own will set you back $1,799. For more, head over to Magnatone.